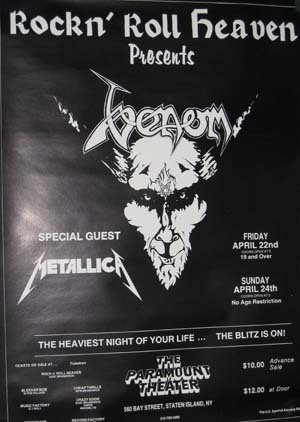 In April 1983 Venom play two nights at Paramount Theatre in New York supported by a young bunch called Metallica. This Venom extravaganza was masterminded by Rock And Roll Heaven organization consisting of the two crazies, Jon and Marsha Z and Harold and Sherry Risch. The second gig went well in comparsion with Friday night's show in which power failures interrupted the crushing of bones and sacrifices of non-believers. With the audience screaming in pain, Venom's American assault had been a success. Hell had truly paid a visit to Statan Island. As for the Paramount Theater, when the battle was over and the rubble was cleared away, it was discovered that one of abaddon's nuclear warheads had blown a four-foot hole in the stage and one fireball had been orbited across the building coming to rest in the upper balcony. Cronos had dealt a destructive blow to his speakers, totally wasting his stacks. When the technician assessed the damage done, the total cost for repairs amounted to "666" dollars! On the second gig the fire marshalls had been raising havoc backstage after all the bombs that went off, so when the band came off stage after the regular set the promoter said: "That´s it, you have to stop before you kill somebody". 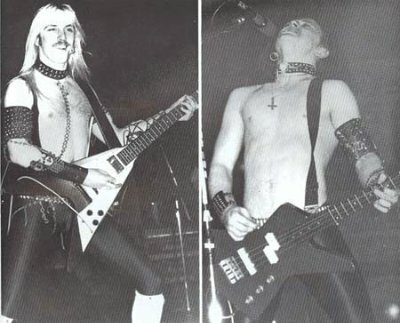 The songs that were planned for the encores that night were: Bloodlust, Schizo and In League With Satan.